Dialog Axiata PLC operates Sri Lanka’s largest and fastest growing mobile telecommunications network. The Company is one of the largest listed companies on the Colombo Stock Exchange in terms of market capitalisation. Dialog is also Sri Lanka’s largest Foreign Direct Investor (FDI) with investments totalling over USD2 billion. Dialog, a winner of six GSMA Mobile World Awards has the distinction of being voted by Sri Lankan consumers as the Telecom Service Provider of the Year for the sixth successive year as well as the Internet Service Provider of the Year at the SLIM-Nielsen People’s Choice Awards for the sixth successive year. Dialog has topped Sri Lanka’s Corporate Accountability rankings for the past six years in succession and is an ISO 9001 certified company. Dialog has been at the forefront of innovation in the mobile industry in Sri Lanka since the late 1990s, propelling the nation’s mobile telephony infrastructure to a level of advancement on par with the developed world. 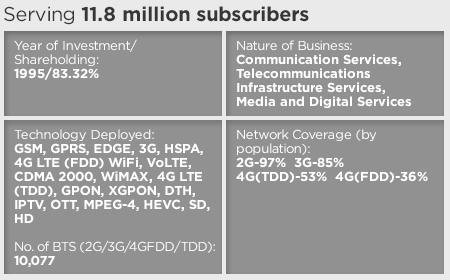 The Company delivers advanced mobile telephony and high speed mobile broadband services to a subscriber base of 11.8 million Sri Lankans, via 2.5G and 3G/3.5G and 4G networks. Dialog supplements its market leading position in the mobile telecommunications sector with a robust footprint and market presence in Sri Lanka’s Fixed Telecommunications and Digital Pay Television markets through its fully-owned subsidiaries Dialog Broadband Networks (Private) Ltd (DBN) and Dialog Television (Private) Ltd. (DTV). DBN is Sri Lanka’s second largest Fixed Telecommunications service provider, serving residential and enterprise customers with voice, broadband, lease lines and customised telecommunication services. DTV operates a Direct-to-Home (DTH) Digital Satellite Pay TV service and is the market leader in Sri Lanka’s Pay TV sector and delivers high quality infotainment to a viewer base of over 800,000 Sri Lankan households.